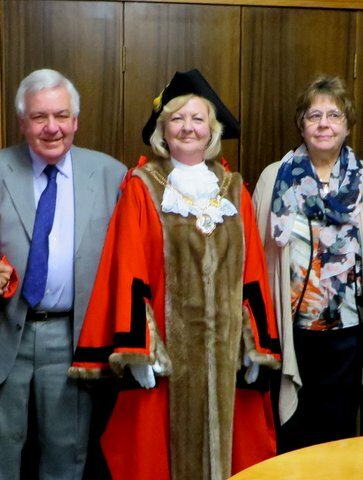 On the evening of Wednesday 8th April 2015 former Liberal Democrat councillors, Robin Studd and Dylis Cornes were recognised at special ceremony where they were official made honorary aldermen of the borough of Newcastle-under-Lyme. Both were recognised for their many services to the local area in their long standing roles as borough councillors. Robin and Dylis are the perfect examples of genuine, hard-working Liberal Democrats who have dedicated themselves not only to the party but more importantly to their local communities. Robin was a member of the borough council for a period of 19 years including as deputy leader and cabinet member for 6 years’ – Robin was on the council from 1992-6 and 1999-2014, and was Liberal Democrat group leader from 2000-2014. Throughout his time he was a member of the planning committee. Liberal Democrat group leader Cllr.Nigel Jones, in introducing Robin, stressed that Robin had contributed to several local history publications on the medieval history of Newcastle-under-Lyme.